Beeman Quick Detachable Sling Swivels 1/2 Set. .
Half set! 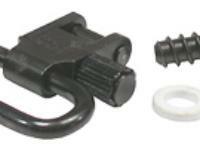 Quick-detach sling swivel includes one (1) wood screw and one (1) 1" swivel. Does not require a socket set into the stock. Installs without dismantling gun. Special 1/2" wood screw fits forearms as thin as 5/8". New white line base spacer is included.